Cattle dogs are found in blue (pictured above) and red (pictured to the right) varieties and have bushy, raccoon-like tails. The coloration of these dogs results from white and grey hairs closely interspersed with red or black hairs, resulting in ticking. They also have some solid, or near solid, patches of color, usually in the form of a mask around one or both eyes. The Australian Cattle Dog should be brushed daily during spring shedding season, due to their thick coat. 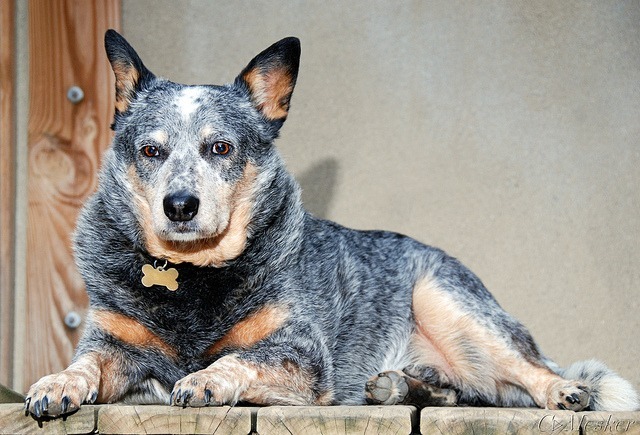 Cattle dogs are wary animals and are naturally cautious. They make perfect guard dogs if trained for this task. They bond well with other dogs, particularly other cattle dogs. Cattle dogs herd cattle by nipping at the heels or tails of the cows. 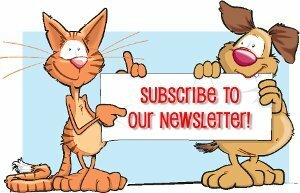 They are also known to “herd” other pets and children as well as vacuum cleaners and lawn mowers. 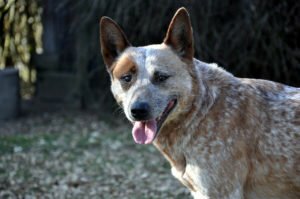 Cattle dogs have very high energy levels and extremely active minds, as do many working dogs. They should be exercised on a regular bases and given “a job” or a varied training routine to prevent boredom. Boredom often leads to the dogs making their own entertainment, usually in the form of destructive activities. Cattle dogs generally excel at dog agility, though can get bored with the same course repetition. They thrive on change and new experiences.